Highlighters just keep popping up out of nowhere, it is certainly the year of the glow. 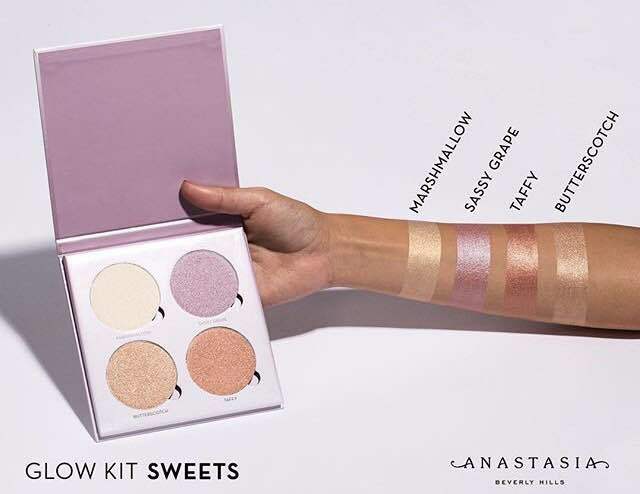 Every cosmetics company is rolling out a new highlight like we're all living in the shadows and Anastasia Beverly Hills too have recognised the insatiable demand for more beaming highlight and rolled out new glow kits to add to their hugely popular existing line. The two new glow kits are Glow Kit Sweets and Glow Kit Moonchild. They are both available from the Anastasia Beverly Hills and retail for $40 each. Each kit offers intense highlight, you can see the swatches above. Sweets is a kit of four highlights and Moonchild is their first kit with six pans of highlight. Let's break down each kit. Glow Kit Sweets contains four metallic powder highlights for intense luminosity. The four colours are: Marshmallow, described as an "intense pear with gold reflect", Sassy Grape described as a "lavender with blue reflect", Taffy described as a "fusion of peach, pink and gold reflect" and Butterscotch described as a "caramel gold with white reflect". Butterscotch is my favourite of the four, as is Marshmallow as they look quite wearable on my warm skin. I think the Sleek Solstice Palette (£10) is similar, but may not be quite as intense (US link). Sleek are very popular now too because of their stunning and affordable highlighter palettes. They are not want to be overlooked if you covet that intense blinding highlight that is all the rage lately. A key difference is that the Sleek palettes have a mixture of textures, the top left is a cream and the others are silky soft amazing powders. I love the packaging and the overall product. 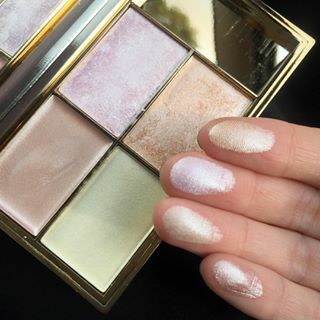 All three of their highlighting palettes: Precious Metals, Solstice (seen above) and Midas are worth a look. 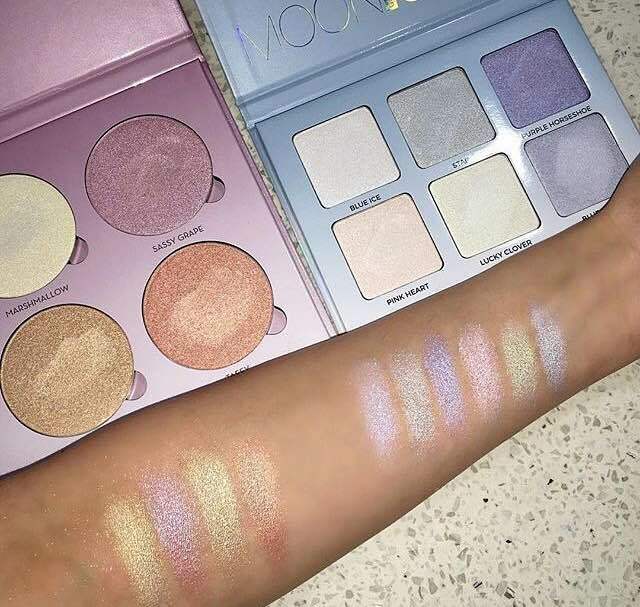 Glow Kit Moonchild holds an impressive six highlighters, all powders. 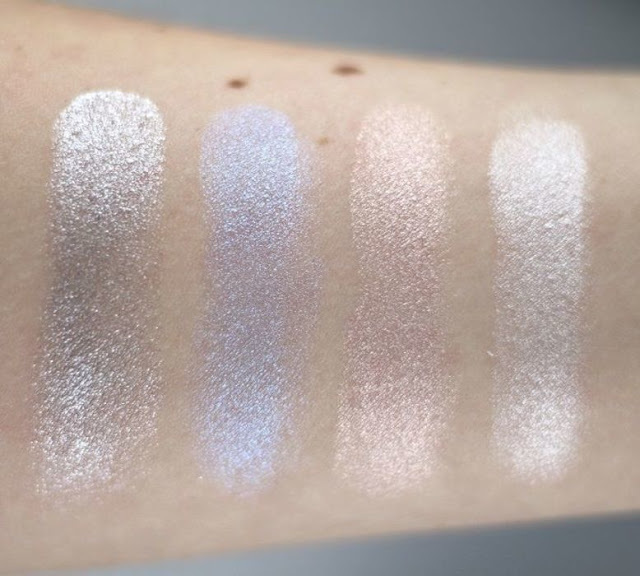 These are magically metallic hihglighters that offer a celestial finish, certainly aptly-named there are a lot of blue and silver tones, so this palette would be best suited to those who prefer cool tones on their skin. The six shades are: Blue Ice described as a "diamond white with an icy blue reflect", Star described as "a moonstone fusion of mint, platinum and silver reflect", Purple Horseshoe described as "a glittering lavender with an arctic blue reflect", Pink Heart described as a "pearl white with a pink opal reflect", Lucky Clover described as "a shamrock-infused gold with canary yellow diamond reflect" and Blue Moon described as a "frozen blue with silver reflect". The swatches can be seen below. 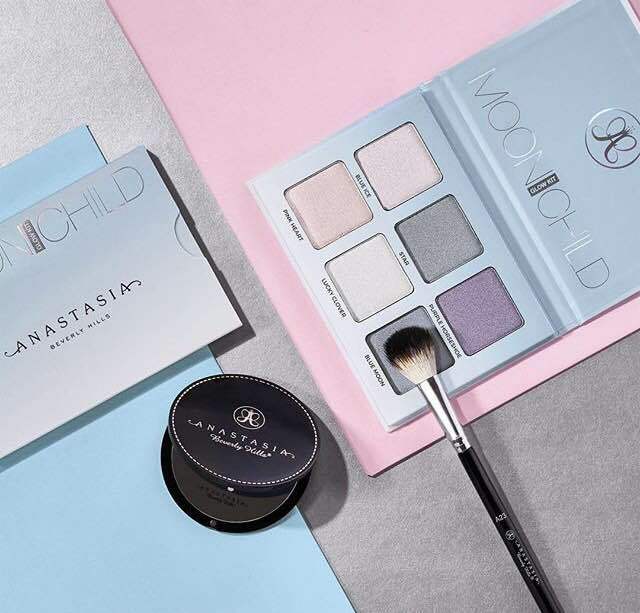 The closest palette to the Moonchild Glow Kit is the Sleek Highlighter Palette in Midas. Again it's £10 or $14. 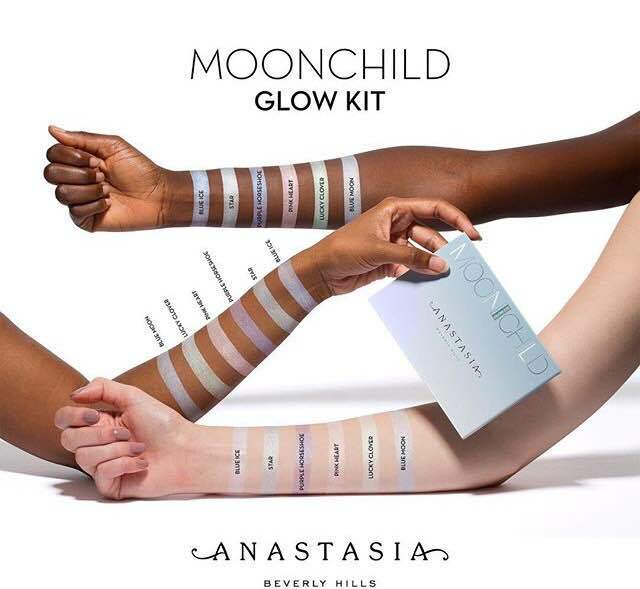 All really cool tones, of course in the Sleek palette all you get is four shades opposed to the six shades in Moonchild. You can see the swatches from the Sleek Midas Palette below. From left to right: Solitaire, Tanzanite, Rhinestone and Cubic Zircona. Again, not an exact dupe but the palette has an overall similar tone and feel if you're looking for something more affordable. Solitaire is a cream, and the other three shades are powders. My favourite out of these is Rhinestone. 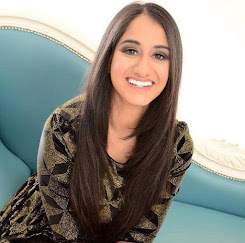 Thank you so much for reading, I hope you enjoyed this post. I would love to know what you think of the whole highlighting trend and these two new glow kits from Anastasia Beverly Hills. Will you be getting any? Do you like highlighters so intense that you could kill a man? They all look so pretty in the palettes, I can't wait to see people showcasing them on social media to see how they look on the cheeks and wherever else you decide to put them. I think they look fabulous in editorial shoots. 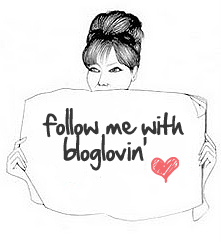 As always don't forget to follow me on Bloglovin', I can't stress enough how much it means to me, I really love reading your comments too so share your thoughts below. Enjoy your weekend. Take care. Oh wow! That sassy grape shade is STUNNING! Great post. These two are So lovely! 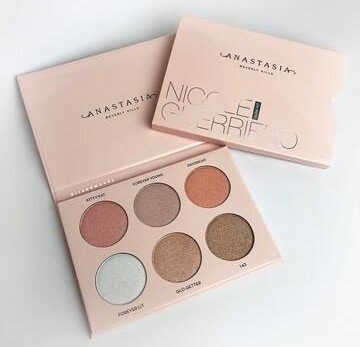 The Sleek palette is very similar to the ABH one so I probably will stick to Sleek which I know has gotten rave reviews and much more budget friendly. I now have all three of the original glow kits, though I've not had a chance to play with them properly yet - however seeing these definitely made me realise that I have more than enough highlighters in my collection ^_^ Plus these colours aren't really my cuppa tea and I think they'd suit cooler complexions a lot more! Wow, the shades look so similar! Thank you for posting! How gorgeous are these?! I love the names too, so cute! That anastasia highlighter kit looks stunning!! I want to get these highlighters in the worst way, they look so stunning!